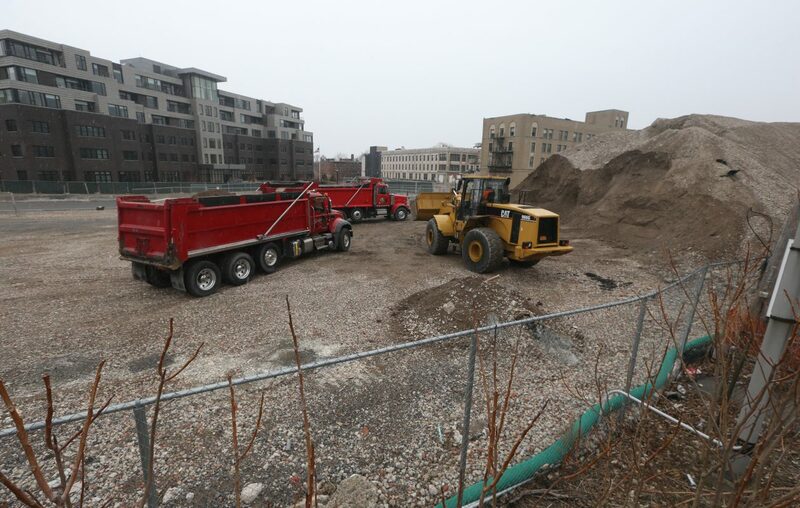 Bright red dump trucks from a local construction company began loading and carting away more than 3,000 tons of crushed concrete from the former Millard Fillmore Gates Circle Hospital site Thursday, much to the relief and delight of both city leaders and neighbors. Over the next few weeks, crews from Michael Serafini Inc. will be working from 8:30 a.m. to 3:30 p.m. on weekdays to transport the dirt and "clean fill" to construction sites for a pair of unrelated local infrastructure or roadwork projects that the contractor is working on, said Byron DeLuke, director of development for TM Montante Development. That process will take about a month, as the companies are working to minimize the impact on the surrounding neighborhood by restricting the hours, staggering the trucks and limiting them to Delaware Avenue so they stay off the surrounding streets. The elimination of the giant mound of dirt represents a major step forward for the overall Gates Circle site, and a victory for the residents of neighboring Canterbury Woods, who have complained for months about the unsightly pile of debris that they nicknamed "Mount Montante." "We think it's great," said Canterbury Woods CEO Rob Wallace. "We're very happy with the direction that we see happening on the site." "We're delighted," said Canterbury resident Judy Duchan. DeLuke said he did not know specifically where the dirt would be used, but noted that it's been certified as "clean" and safe for reuse by the state Department of Environmental Conservation. Serafini will cover the cost of removal and transportation. That still leaves the other half of the pile, which totals almost 7,000 tons in all, stemming from the demolition of the former main hospital and other buildings that was already completed. However, DeLuke said the developer is already seeing demand for such material, and expects to have no difficulty offloading the rest. "There just wasn't any interest in the winter months," DeLuke said. "We were very hopeful that with the spring construction season, demand would increase and we’d find an off-taker. And while it may not feel like spring, it is spring, and the pile is starting to be removed." Regardless, though, TM Montante committed to city leaders and neighbors that the entire pile would be gone by June 15, even if the developer has to take the rest to a landfill, at its own significant expense. "If we turn out to be wrong and the demand isn’t there, we’ll remove it ourselves," DeLuke said. "But we're confident we’ll have an off-taker for all that fill within a couple of weeks." The pile is across the street from the back of the 58-unit senior community, and residents see it every day from their windows. That's detracted not only from their quality of life, they say, but it's also hindered the leasing for the remaining units. The Episcopal Church Home & Affiliates, which owns Canterbury Woods, even sued Montante over the pile and lack of progress at Gates Circle overall. DeLuke said Montante officials were aware of the concerns and eager to get rid of the dirt. But since the former hospital site was a "brownfield," they had to wait until the state DEC tested and certified the material as clean for reuse, which only came in the late fall. In December, the developer began contacting trucking and construction companies that might need the material. But by then, he said, the winter season had arrived, so there was little demand among construction companies until now. TM Montante, which acquired the entire site from Kaleida Health after the hospital closed, is redeveloping the 6.7-acre property into the new Lancaster Square community, expected to feature a mixture of residential and commercial space, through both renovations and new construction. Plans for the $150 million project include up to 500 condominiums, market-rate apartments and townhouses, as well as a grocery store, a fitness club and ground-floor retail storefronts. The developer already sold land to Canterbury Woods for its $41 million project, and to People Inc., for a separate three-story senior housing building at 637 Linwood Ave., with 37 units. It also bought an aging building at 1275 Delaware, adjacent to the hospital site, and negotiated an agreement with the city to buy a nearby parking ramp. And it received approval for construction of a new six-story building at 1299 Delaware, with 60 market-rate apartments and three first-floor storefronts. It's also begun drafting ideas for two other buildings. But Montante has been unable to proceed with its own plans while the entire project remained tangled up with Robert C. Morgan and his Morgan Communities. The Rochester developer had teamed with Montante as an investor and experienced partner, but a federal mortgage fraud investigation has now thrown his entire future into uncertainty. His son and nephew, along with two Buffalo mortgage brokers, were indicted last year, and his nephew and one of the brokers have since pleaded guilty. DeLuke said Thursday that Morgan and Montante have a signed agreement for Montante to retake full ownership of the Gates Circle site, but that several federal agencies must approve the deal because of the FBI investigation. Once that happens, however, Montante is ready to proceed with the new project at 1299 Delaware, which is fully designed, and a planned renovation of 1275 Delaware that is being planned. The Common Council has approved a purchase contract for the parking ramp – which is critical to the project's success because lenders want to see that parking has been secured, DeLuke said. But that's also tied in with a proposal for the city to designate the entire site as an "urban development action area," which would allow for more generous property tax breaks over a longer period of time. DeLuke said that's essential for the project financing, because of the significant gap that exists between construction expenses and expected rents. The proposal will be considered next week by the Council. However, such a designation – normally reserved for areas that are blighted – is controversial, with critics saying the Gates Circle area does not fit that description. "We've tried to be clear that the project requires a public-private partnership," DeLuke said. "We’re not saying the neighborhood is blighted. We’re saying the hospital site is deteriorated, substandard or at risk of becoming that."